It is only in a universe of comparison that I can say this, but as I do live in such I won't hesitate: that was much better. Last year my showing in the National Capital 20 Miler was, shall we say, not my best work. I was very slow. I walked a lot. I was in a fair amount of pain by the end. Chalk it up to not being used to trail running and general under-training or whatever you like. I got it done - but it wasn't pretty. But I signed up again this year for two reasons: 1) There's nothing like running your twenty mile NOT on a treadmill, not looping endlessly around the same runnable portions of your neighborhood, and - this being my favorite part - with water/Gatorade stops built right in; 2) REDEMPTION RUN. I talked about the course itself last year, and it is the same: 10 miles up the C&O Canal Towpath, 10 miles back the way you came, the end. So I won't be diving too much into scenery and what have you. But I do want to discuss the unique experience of this particular event. When I talk about the race with others, I describe it as "barely a race." Not in the sense that you're not really running (FAR FROM IT), but rather because the casual nature of the whole thing makes it feel like a training run that a couple hundred of people happen to be doing at the same time. For starters, the whole thing is barely a 15 minutes' drive from my house. That's kind of unique to me, but most runners are coming from close by. So the first thing you do is get up at what feels like an almost reasonable time (5:15am in my case, but I could've slept in another half hour and been fine except I'm a paranoiac) and just driving straight to the starting line. Literally. Last year I accidentally parked in a satellite lot that required me to walk a bit, but this year I new better and was able to leave my car in a lot right next to the start. Packet pickup is also 100% possible the morning of the race, and I availed myself of it before doing all your standard pre-race things: using the porta-potty, eating a snack, etc. I hung out in my warm car until about 5 minutes before race start. The course is bib chip timed, but there's no opening remarks, no fancy "start" or "finish" proscenium, and no corrals. It's up to you to hang back or up front depending on how fast you think you'll be (naturally I go for the back third). At 7am, they said go, and we crossed the start pad and went. And I felt pretty good! Not great, but solid. 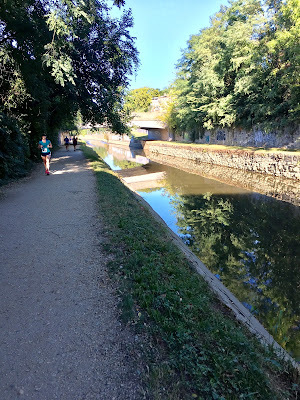 I had a good rhythm going and enjoyed my music as I cruised along the remnants of the C&O canal. Not speedily, mind you - there's something about the towpath that my body doesn't love. At Navy-Air Force the week before I clocked under a 10 minute mile average for the whole thing, yet on the C&O trail I can't seem to break 10:40 in a single mile. Ah well. At least this time I knew what to expect. Important note about the trail, though: in addition to being slower (for me), it's also a touch dangerous. There are large rocks everywhere, and the occasional hole for good measure. You could turn your ankle or worse if you're not paying attention. I came down on a couple rocks wrong; luckily I have flexible ankles or things could've gone badly for me. This race tends to attract the faster/more dedicated runners in the area, as I only finished ahead of a little over 60 runners out of just under 200. Which is why I always already seeing runners coming back toward me on their way back to the finish by mile 7. But I saw something weirder: people wearing completely different bibs. And then, just before the turnaround point, I saw the finish line - for a different race. This race is also barely a race in that somehow other races are going on the the same time in the same area. No idea what their parameters were but I saw people wearing the other bibs going in both directions. Very weird and disconcerting. This race is also barely a race in that the path isn't closed to anyone. There are casual runners and hikers there too, and dog walkers. I love seeing the dogs, but you know that would never fly on most courses. I also saw a guy biking verrrry slowly behind a race participant as her personal support bike. Adorable, but another thing that would be hard to pull off in most of your bigger races. Anyway, I hit the turnaround point, grabbed some Gatorade, and plugged on secure in the knowledge that every step I took carried me closer to home. Naturally I was ready to be done by mile 11 but who isn't, really. I saw fewer stragglers on the way to the turnaround point behind me this time; I think I saw my last one while I was on mile 12 and therefore they were on 8. From then on it only got harder - but not nearly as hard as last year. Yes, I was slow, but I was plugging on! Thanks to the KT Tape Pro I had applied to both hips AND both knees, I was feeling no unusual discomfort! I only stopped for water stops! I never walked otherwise! In the end I crossed the finish line with a time of 3:46, slower than what I could've accomplished on a treadmill, yes, but a full 9 minutes faster than last year. Not too shabby, all things considered. I think I can be so bold as to call myself redeemed, even. There were bagels and fruit in the parking lot but I was ready to go home and shower more than anything else. I hopped in the car and was in my shower in under 30 minutes. Location, location, location. Having exorcised the demon that was my first time in this race, would I do it again? Probably, yeah. Look, it's long and boring and not at all speedy, but it's convenient and a great way to basically have my 20 mile practice run done for me. If I'm not training for a marathon, I'd skip it, but any time I am, I'm inclined to add it in there so long as I remain in the neighborhood. I'm really happy with the outcome not only as regards my performance, but also my body. I used my Nike Zoom Vomero 10s and taped all my problem areas - and came out feeling good. I've got some joint stiffness, but no stabbing, jolting, or otherwise unusual pains. I think I can use the same methods for MCM and feel a-okay. Next up, the big one: THE MARINE CORPS MARATHON. Have you ever been in a race and suddenly there was a different race on the same course? I must admit that one surprised me. DOGS ON THE COURSE?!? Why have I not done this??? Oh that's right. I don't run that far and even if I did, they'd close it down before I finished because I'd be too busy GIVING ALL THE BELLY RUBS. Sure, but think of all the dogs you've had petted!